Hello everyone! This is a build guide to my Ground Slam Juggernaut. 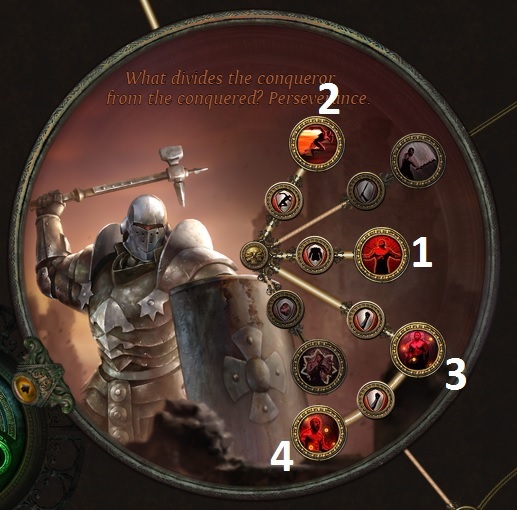 This build focuses on building a straightforward, very defensive Juggernaut with a 2-handed mace. This has been my main character ever since i've played the game. T1 or T2 skill, yet it has always been my absolute favorite, even more now that stunning items got a small buff in 2.6, and GS's Threshold Jewel was remade. -Please refer to Earthquake guides if you wish to play EQ. Forums are flooded with EQ guides. This guide is for Stunning Ground Slam, which is very different in passive tree, itemization, and mechanics. -Viable for normal Atziri and all Guardians. -Beginner friendly, does not require Super expensive items. -Resolute Technique limits our damage in the endgame since we cannot Crit. Maces have never been good for crit builds. -Not Uber Atziri/Shaper viable. Damage is simply not high enough compared to double-dipping or crit builds. Leveling with the build is easy. You can start using Ground Slam in Act 1 normal, which you get from Nessa right after killing Hillock and entering Lioneye's Watch. Switch to Quality GS when possible. Advance to Resolute Technique in the passive tree as soon as possible. Start moving to the duelist area, and later to the templar area. Kill all for +2 skill points. New 3.0 Oak bonus is terrible, while Alira and Kraityn are useless for this build. -Mana leech can be crafted on a free prefix slot on gloves. 0.2-0.4% is enough to sustain mana. Get Mana Leech on jewellery, if you use Veruso's Battering Rams, which I highly recommend. New 2.6 Version of Redblade Tramplers have 50-70 Life, and movement speed of 25%. Excellent and cheap boots with Stun Threshold and little flat damage. Veruso's Battering Rams are an excellent and cheap choice for gloves. They negate the biggest downside of Brass Dome, 50% increased shock duration on player by granting us immunity to Shock on full Endurance Charges, along with little movement speed. Pay attention to your resistances if you choose to use Veruso's along with Brass Dome and Redblade Tramplers. Optimal Veruso's have the Curse enemies with level 10-12 Vulnerability on hit. No need to reserve mana with blasphemy, and Intelligence requirement for this build drops from 155 to 111-114, for level 20 and 21 Inc AoE / Conc effect. Having Cold Resistance on your Stun Threshold belt makes it easier to switch between Perseverance and other belts. Optimal 2-Handed mace would have good physical damage, good attack speed, Stun threshold and duration. I managed to craft the Piledriver on the left this week, and I prefer it though it has less dps than Meatgrinder. However, Piledriver is the fastest 2h Mace Base with the best Implicit of 45% increased stun duration on enemies. Instead of highest DPS I went for the highest speed. This also increased my clearspeed and quality of life significantly. Very fast weapon also helps in difficult boss encounters, where I may switch Added fire to Life Gain on Hit gem. Tidebreaker is an excellent Stun-oriented weapon that can be used up to endgame. Marohi Erqi is a fine unique weapon, if you cannot afford a good rare 2h mace, or Tidebreaker. The chance to stun is based off the damage done in a single hit compared to the target's maximum life. The default length of stuns is 350ms. Reduced stun threshold modifiers reduce the value of Defender's effective max life. For example, 25% reduced Enemy Stun Threshold means the enemy will be treated as if their effective max life is only 75% as much as it actually is, increasing the chance that the enemy will be stunned. Refer to PoEWiki for more information about stunning. Brass Dome is the core defense of the build. Around 4k armour that we double with the Unbreakable Juggernaut passive takes our armour to extreme levels. Immunity to extra damage from Critical Strikes helps against spell damage peaks. These usually sell for 1-2ex in a new league. Before you can get your hands on it, use body armour with Life, High armour, and resistances. There have been some questions regarding the amount of armour. With full Endurance charges, our armour goes way over 90% Estimated phys reduction. However, "Estimated Physical Damage Reduction" Is not a reliable source of information. This is the amount of damage you are estimated to mitigate when a normal monster of your level hits you. Imagine Minotaur hitting you for 5k damage. How much armour do you need to reduce it by 50%? Fortify and Endurance Charge values are calculated on top of the effect of Armour. Video below demonstrates how Armour actually works against damage, and why we scale it very high. Look for Life, Attack speed with Maces, and Physical damage. Rapid Expansion Threshold jewel got a nice buff in 2.6, granting Ground Slam a 35% increased angle, and a 25% chance to gain an endurance charge on stun. It is good to have at least 1 of these socketed in the tree. I use only 1 Rapid Expansion. This can be considered as a DPS increase for the simple reason that your attack will hit more monsters at once. I feel that 121 degree cone is great enough. The rest of my sockets are filled with 7% life, mace AS, Dmg jewels. This is my current setup with an instant Life Flask, Bleed removal flask, Quicksilver, Silver Flask and Lion's roar. On my Instant Life Flask I have Poison removal, and Bleed removal on the other. It is a good idea to have Shock immunity on your Silver Flask, IF you don't use Veruso's. Setup has gone through some changes for 3.0. This is my current setup. I use Heavy Strike for bosses that can be stunned, up to T15 Maps. For mana reservation, I use Vulnerability with Blasphemy, and Haste. Socket these in the same item, and throw in an Enlightenment to reduce mana reservation. I use Blood Rage for more Life Leech and extra attack speed. This is completely optional and down to personal preference. These are my skill trees at level 98 with slightly modified variations for different purposes. Unyielding / Unrelenting is down to your personal preference. If you have any questions, notice a mistake or have suggestions, please let me know in this thread or ingame. My IGN is Paukuttaja. I'm happy to help all beginners and experienced players alike, so do not hesitate to ask! You players who play this build and have been active on this thread are the reason I keep updating and adding information and content to this build. Ground Slam, now and forever. Groundslam is one of my favourite skills, I'm glad to see a build that is less of a joke and actually viable in HC. P.S Thanks for this, I'm really looking forward to doing this. "Have you ever seen the true face of God, Exile?" With this amount of phys mitigation u can easily swap ur boots for rare and ur helmet for abyssus. It will make ur build more guardians viable. Maybe even shaper. Switching to abyssus gave only 14k dps (Conc effect, hatred, 3 frenzys, 5 endurances, Blood Rage) and for the fact that this is a RT build, it's huge melee crit multiplier goes to waste. To get better use of abyssus, it is better to use it with a Staff (Mostly Hegemony's Era) for better critical strike abilities. F.ex the Life generation pr.endurance chargge node, and the Tirelsess cluster brings some nice QOL. Thank you Dkodr for replying! I remember your guide back in the day, and it was one of my innovators back then with the idea of applying Heavy Strike for single target DPS. You are right, so much life regen for only 1 point is definitely worth it, I will see this change in my tree. Tirelessness however, is no longer that valid after they reduced melee skill mana costs significantly few leagues ago, and as it also costs 1 travel point, I prefer to fill the big life wheel instead. Keep up the slam! How would you go about the tree for a more crit oriented/hegemonys era groundslammer? I assume go for some abyssus action and switch out some gems? Thanks in advance! You will need Immortal Call setup with abyssus. I tried Minotaur with Abyssus, and without IC setup it was a complete disaster. Damage is higher with crit staffs, but lack of mace and stun in general will make monsters with big life hit you hard. For Juggernaut, you can choose Undeniable to get 1% increased attack speed for every 200 accuracy, which you will have a couple tons with crit. I recommend Unrelenting to keep up Endurance Charges for Immortal Call + Cast when damage taken setup. For gems, prioritize +Life%. Rest of the stats can be Crit Chance and Staff Damage. You may want to skip Attack Speed, if you choose to use Juggernaut's Undeniable passive which gives alot of AS along with all your Accuracy. Thanks a bunch for the thorough reply, will be trying this out for sure! Also in which order would you take the ascendancies? 4. Unstoppable / Undeniable / Unyielding are all good options. Unyielding may be the best choice if you are having trouble staying alive with abyssus. Unyielding goes really well with this belt. You get Fortify on Stun, and Onslaught when fortified! It costs only 1 alchemy on league, and few chaos on Standard.